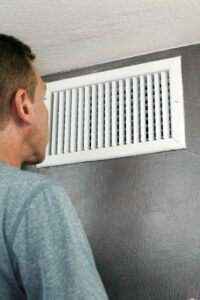 Indoor air quality often goes overlooked when it comes to health concerns. Find out the truth about air indoors and how it might be affecting you. We all know that pollution is not a good thing for our health. In some crowded urban areas, you can even see the smog and dirt particles floating in the air. Science has already shown plenty of evidence that breathing in airborne particles can cause serious respiratory problems. What a lot of us don’t realize, however, is that the air we are breathing indoors is much worse. According to the Environmental Protection Agency (EPA), the air inside our homes and offices can be up to ten times worse than outdoor air in the immediate surroundings when it comes to air quality. Indoor air may be the number one environmental health issue of concern. Americans are spending a lot of money each year on respiratory symptoms that may be traced back to poor air quality in buildings where they spend the majority of their time. The EPA has released some alarming facts about indoor air quality. Over eleven million people in the U.S. suffer from asthma, and another twenty-eight million have environmental allergies. Almost half of the buildings in the nation pose high risks for poor air quality—many of them are workplaces that cause employees to get sick from prolonged exposure to airborne pollutants at work. Hundreds of thousands of man-made chemicals have been manufactured in the last 100 years, and each year thousands more are produced. Many of those chemicals have made it into our homes and jobs, used in cleaning products, fragrances, and other products we may use every day. The chemicals alone can pose a risk. What is even more of a risk is when those substances are combined with mold, mildew, or other allergens or chemicals. While the exact danger of these combinations has not been excessively studied, we do know that it is not good and that the combination creates a cocktail far more potent than either substance alone. They all mingle together and become more concentrated over time. Examinations of HVAC systems and air filters has found high instances of fungus, bacteria, viruses, and other unwanted triggers of disease or allergies. Although it may be somewhat known that indoor air quality suffers from the number of chemicals, particulates, and volatile organic compounds (VOC’s) present, what may not be so obvious is how it is getting worse over time, and affecting more people. Asthma, in particular, has reached epidemic proportions—over 1 in 9 people under 18 now are diagnosed with asthma, and asthma cases in total have doubled since the mid-1970’s. Even if you have a chronic illness not necessarily associated with breathing problems, it can be made worse by exposure to particulate matter in the air. Construction of buildings is becoming more and more precise and airtight, which is a good thing structurally, but means there is no circulation or dilution of the air inside. People are also spending more and more of their time indoors—over 90 percent—and as a result, indoor air can affect them a lot more than outdoor air can. Should I Be Worried About My Indoor Air Quality? The short answer is, yes. Since we spend much more time inside, we are more susceptible to indoor pollutants. Buildings are being built to be more cost effective regarding energy use—this means less ventilation and more recycled unclean air throughout. Modern construction materials that are now used, combined with more consumer products that off-gas synthetic materials, mean more and more toxins that are getting into our system through the air. Have you ever been sick at the same time as those around you at home or at work, without anyone else you’re exposed to getting sick? 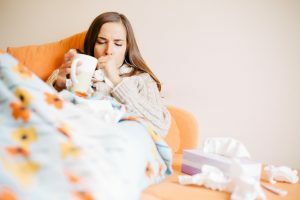 This is often referred to as “sick building syndrome.” It occurs when everyone in the same indoor environment falls ill because of the toxins they jointly are breathing in. Indoor air pollution is now regarded as one of the highest risks to health in the U.S.
With our modern lifestyles, it is not possible to avoid indoor air. In order to do something about the situation, we must focus on improving the quality of the air we are breathing in. The three actions needed to accomplish this are dilution, removal, and neutralization. These may not eliminate indoor pollutants 100% but can lower it to levels that will no longer have detrimental effects on our health. Dilution can occur when fresh, clean outdoor air is allowed to mix in with the indoor air. This makes the indoor pollutants less concentrated and less potent. If in a polluted urban area, however, this could actually be worse because outdoor air may be equal or worse than the indoor air. The best solution for removal and neutralization of indoor air pollutants is a high-quality HEPA air filtration system. 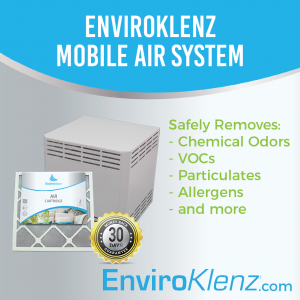 The EnviroKlenz Mobile is the best HEPA purifying system out there—it combines HEPA technology filters with EnviroKlenz’s own unique cartridges to effectively trap, deactivate, and remove particulate matter and VOC’s from the indoor environment. It is perfect for home or office use, which is where we spend the most of our time. It covers an area of up to 850 feet and is able to be transported from room to room to ensure complete coverage of the space. Many other air filter systems merely trap these harmful particles, only to release them back into the air as air circles through, but EnviroKlenz’s amazing technology actually removes the toxins from the air. VOC’s, fragrances, malodors, and other harmful substances are eliminated. Many customers notice a difference within mere days of using the system. Your health is important. Indoor air quality could be the single biggest risk factor for many health problems these days. Take the necessary steps to ensure the air you, your family, and your coworkers are breathing is clean. Order the EnviroKlenz Mobile today.